You’ve heard of the Facebook tradition of Throwback Thursday, right? That ol’ #TBT? If not, Throwback Thursday is the day you upload an old picture of yourself on your profile page to illustrate the passage of time (and your hairstyle history). The practice has sent a lot of people back to ancient photo albums, slide carousels and snapshot shoeboxes to dig out some of their less-embarrassing pics to post. As you may have noticed, however, old photos and slides often fade over time, or the color distorts to odd casts — especially if the original media hasn’t exactly been stored in archival conditions in the first place. Sure, maybe you can pass off the weirdness as an Instagram filter, but maybe you’d rather accept the challenge, clean up the photo and return it to a more reasonable representation of the original scene. If you’ve got image-editing software on your computer, you can do your own color correction, fix blemishes and sharpen up those old snaps with relative ease. And really, who doesn’t have image-editing software on their computers these days? For example, Windows users can grab Windows Photo Gallery (shown above) for free and Mac users have that copy of iPhoto that came with their computers. Cost-free, cross-platform options like Google’s Picasa (shown below) or the open-source GIMP also await. Beyond those are the programs you pay for, like the industry-standard Adobe Photoshop, the home-user edition, Adobe Photoshop Elements, or any of the other third-party picture programs around for Windows or OS X. So you have the software if you want it. Windows Photo Gallery. This freebie for Windows users has a Retouch button to fix blemishes in the images and an Auto Adjust feature to help pump up color and contrast in faded old prints. iPhoto. 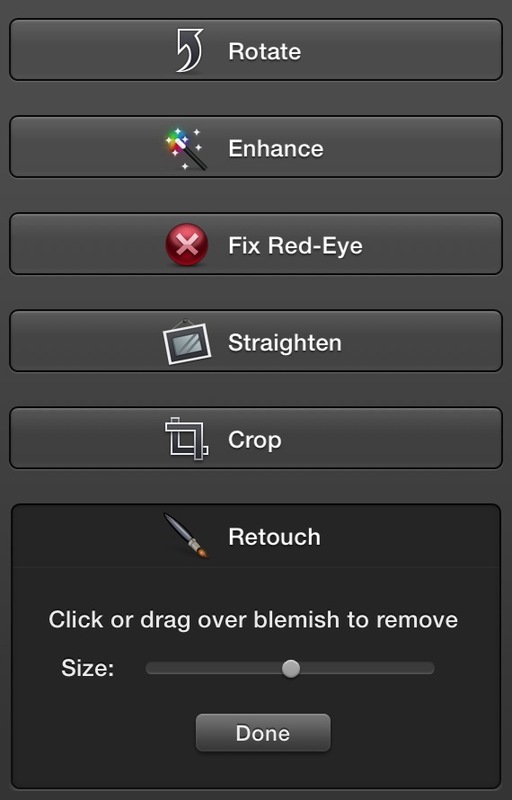 The program’s Enhance tool can often boost a photo’s colors and correct the contrast with a click, but you have more tools at your disposal, like the Retouch brush (shown here). 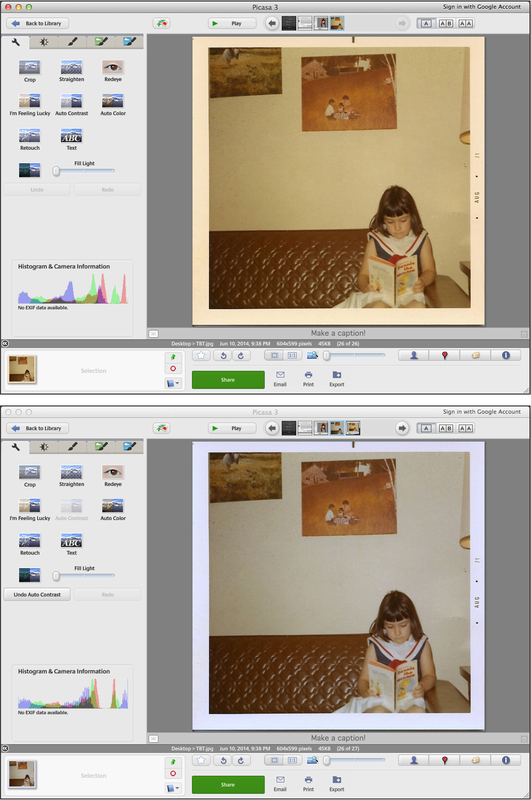 Moving beyond the the OS photoware, the help guide for Picasa has a whole section devoted to photo-editing tips and there’s GIMP documentation for improving color and making 35mm slides look much better. If you’re rocking the full Adobe Photoshop, Adobe has a tutorial video that shows how to restore a damaged print. Also on the Adobe site: and Colin Smith’s No Stupid Questions show has some tips on touch-ups and working with channels in RGB files. The Digital Camera World site has a photo-restoration guide as well. Those with the Adobe Photoshop Elements software designed for the home crowd can also find plenty of picture-restoration info around the Web and a tour of the more helpful Guided Edits tools in the latest version of the program. If retouching (without quite knowing what you are doing yet) makes you nervous, make duplicates of your scanned photos and spend some time experimenting with your program’s color and repair tools. Many programs also include a “revert to original” option in there for your peace of mind. Once you get the hang of it, you can make all your old pictures look a little bit better and there’s a bonus to all this: Aside from wowing your Facebook friends with your past history of synthetic fabrics, big hair, shoulder pads and other fashion choices of your era, you now have handy electronic copies of your fragile old analog media that you can store more easily and back up regularly. And remember, it’ll be much easier to eventually convert those files into holograms for your grandkids to laugh at if you’ve already got the pictures digitized.